Crawl is one of the best local multiplayer experiences on Xbox One. Full stop. 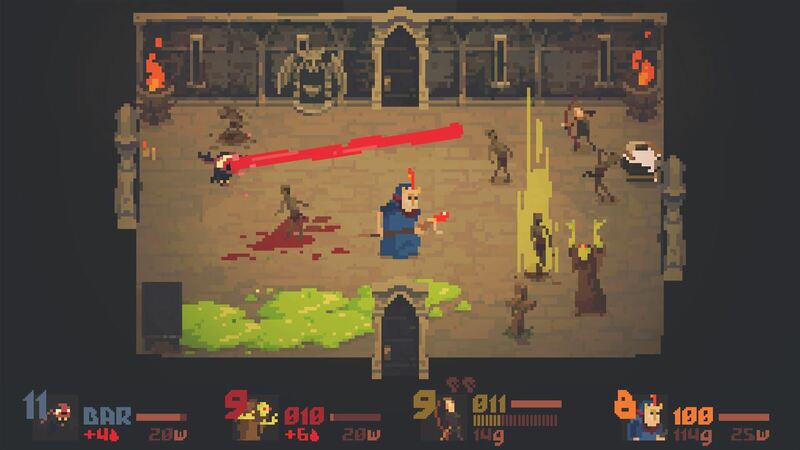 By raising the stakes in the dungeon crawler genre by changing it from a cooperative experience to a competitive one where human players control the hero AND the monsters it suddenly gets really intense, really frantic, and really fun. Wrap it all up in awesome looking oldschool sprite graphics and amazing music and you have a pretty great package all around. See all of the details here in our full Crawl Xbox One review. Crawl is an asymmetrical local multiplayer (local only, no online play, and there are A.I. bots if you need them) game for up to four players. Your objective is to escape the dungeon and to do that you have to reach level 10, then find and use a portal that takes you to a boss monster, and then kill the boss so you can escape. This is easier said than done, of course, because your three friends sitting on the couch next to you are trying their best to stop you by playing as ghosts who control the monster hordes that stand in your way. If a ghost player kills the hero, that player then becomes the hero while the previous hero is now a ghost and the cycle continues kill after kill, floor after floor, until someone wins. Of course, if you challenge the boss monster three times and lose, then no one really wins. Well, technically the ghost players “win”, but in doing so they unleash the boss monster on the rest of mankind and plunge the world into darkness. Uh, “Go team”, I guess. The nuts and bolts of the gameplay are deceptively simple, but that is why it works so well. Each player, hero or monster alike, has two attacks – a normal attack and a special attack assigned to the A and B buttons. That’s it. The hero collects gold that they can spend in shops – one shop on each floor – to buy new weapons, special attacks, potions, and more. The hero is also the only player that collects XP, which is important because you have to level up to level 10 in order to challenge the boss. The ghost characters are not corporeal but can attack in a couple of ways. They can possess pots and furniture and hurl them at the hero as well as take control of traps and spring them at the right opportunity. Ghosts can also use summoning portals to call in monsters, which they will then directly control. There are sixty monster types in the game, all of which play a little differently. Ghost players collect Wrath which they can use to upgrade their monsters to make them bigger, stronger, and more powerful. As you can imagine, the game starts out pretty slowly as everyone has dinky monsters and the hero only has lame weapons and no abilities, but as the game progresses and everyone gets more powerful things get pretty crazy. The player controlling the hero can change multiple times per game and the constant changes in the dynamic of who is a ghost and who is a hero and who has the best monsters etc. really makes every round you play distinct and fun in its own way. No two rounds will ever be the same, and that’s awesome. 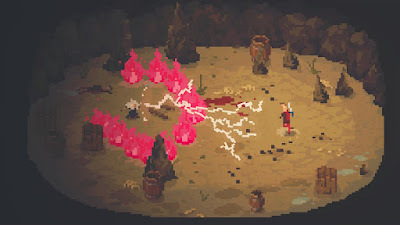 My only real complaint with Crawl is that, while it does have A.I. bots so you can play it solo if you want, it isn’t nearly as fun by yourself as it is in multiplayer. Even with two players the game is exponentially more fun, and having a full squad of four human players makes it incredibly good. I don’t really fault the game for not having online play, as this sort of experience is much better in local multiplayer, but it did need something a little more meaty for solo players. Keep this in mind if you’re considering buying it. The presentation is simply awesome in Crawl with a fantastic retro sprite-based aesthetic that looks fantastic. Despite having relatively simple character designs you always know exactly what is happening at all times, which is really quite an accomplishment considering how crazy things can get. The backgrounds also look absolutely fantastic. 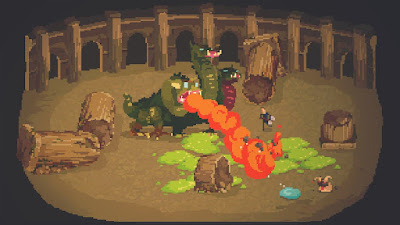 Crawl also sports an outstanding chiptune soundtrack and great monster noises that perfectly set the mood. In the end, Crawl is a fantastic local multiplayer game all around that I can’t recommend highly enough if you have friends around to play it with. The constantly shifting dynamics of who controls the hero and the various monsters make the game fast paced, frantic, and very fun. With this much fun and almost limitless replay value for just $15, Crawl is a no-brainer. Buy it.